“Any hope that the Obama administration would roll back the constitutional excesses of George Bush in the war on terror was extinguished today." Luckily, Ruben Bolling has the useful info you'll need. 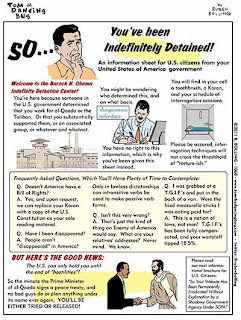 "So... You've Been Indefinitely Detained! Helpful Information From Your U.S. Government!" And even if you're absolutely convinced that Mr. Change You Can Believe In would never use this indefinite dentention power for ill (which, to be clear, I'm not), are you as confident that the next Republican president won't? Really? And to end on an up note (that's sarcasm), read this. More on the horror of that defense bill here.